With not just one, but two British Ironman athletes to follow in the footsteps of, Abigail Bayley may have her work cut out. Nevertheless she's proving, as so many athletes do from Team TBB, that anything is possible. 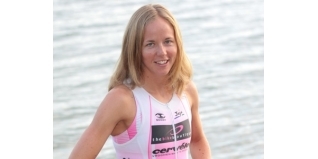 Now approaching the end of her first season with the rather invincible triathlon squad, she can look back on a great year, which saw her run a marathon PB of 3.01 at Ironman UK and finish second just 12 minutes behind fellow team mate, Bella Comerford. Abigail tried to join Team TBB three years ago, but Chrissie Wellington beat her to the post. Finally though her waiting has paid off and her coach, Brett Sutton, who I spoke to recently, believes her patience in waiting to join the squad will pay-off, "Abi has waited three-years to come into the squad. I picked Chrissie over her because at the time, Chrissie was more desperate to achieve. When Chrissie left the squad at the end of last season I gave her the opportunity to come and join us, and this time she literally jumped at it with both hands." He went on to say what an asset she has been to the team, "she has been a great addition to the team both as a person, and now she is starting to work really hard, as an athlete too. She makes Team TBB a better place and I am pleased she had the patience to wait to join the squad." With the bar set so high she's got a lot to live up to, but, if 'The Boss' can work his magic on Abi, as he has done with Bella and Chrissie, the future certainly looks very rosy indeed for this fast improving Ironman athlete. AE Well, firstly Abi, congratulations on what has so far been a brilliant season, you must be pleased with how things are going? AB Thanks, things are finally going in the right direction thanks to The Boss and Team TBB. There's still lots of work to do though. AE Of course, but as you say, things definitely seem to be heading in the right direction for you and your result at Ironman UK was evidence of that. It must have been a real joy to finish on the podium after a rather disastrous 2008 Ironman UK? AB IMUK 2009 was my best race so far. The whole Bayley family was there to see me finish, which made the day very special. I was especially happy with my run, which at 3.01 was a PB for me. I was only 12 minutes down on the win instead of nearly two hours - that’s progress I think. AE There's been a lot of talk about a very tough race, in rather crappy weather conditions and a lot of mud, tell us a bit a about the race? AB Ironman UK this year featured some wonderfully typical English summer weather, lots of rain and wind. I have come to the conclusion that I am some sort of weather curse when it comes to racing so I would like to apologise to anyone who races with me in the future! I am just back from an unseasonably cold and wet Gerardmer Tri in France so the curse struck again. The weather in Bolton didn't really affect the race though, it's the same for everyone. I struggled more with all the tight corners on the bike course, which is not my favourite part of the race! AE This is the first season you've trained with the legendary Brett Sutton and Team TBB, give us three words that best sum up ‘The Boss’, as he’s affectionately known by his athletes? AE So is the training with Brett as hard as it’s renowned to be? AB There are lots of myths and stories about Brett and his training, I know, I had heard some pretty scary stuff before joining the squad. But the answer to your question would simply be that, we do train very hard! AE How hard is it to train in such close proximity to your other team mates, who are also your rivals on race day? AB It's incredibly inspiring and motivating to train with some of the best girls in the sport. You know if you are doing well in training you are going to have a great race. I try not to think about the other girls as the opposition until we get to the startline. I think we are all very keen to encourage each other, we all want the team to be the best it can be, and of course we all have quite different weaknesses and strengths. AE Brett has so many great Ironman athletes in his squad but who’s your favourite training partner out of everyone? AB Anyone who pushes me that little bit further than I thought I could go. AE What's your favourite training session? AE Sounds like a lot of fun! You quite obviously enjoy the tough training required to become a great triathlete, but how did you come to choose triathlon as your sport and what sport did you do before triathlon? AB When I was younger and at school I ran track and represented England at x-country, and I also did a bit of swimming. My triathlon career kicked off when I decided to try and get fit again after three years of overindulging at Uni (Snakebite & Black and Millionaires Shortbread were favourites). I wanted to run the New York Marathon but got injured and so started cross training then bought a bike. After getting over my initial horror about cleats and being attached to my bike I learned to love it and had some success as an age-grouper so decided to give racing pro a shot before I got too old. AE And what were you doing before you became a full-time athlete? AB I was a legal secretary. I quite enjoyed my job and had been given the opportunity to train to be a legal executive; it was that or triathlon. AE You obviously made that right decision, there's no comparison really is there? Ten-hours a day or so in an office or training all day long in the Swiss mountains... So now your day is all about training but what do you do when you're not training? AB Eat, sleep or complain that I am hungry or tired! AE So you don't sneak in the odd night on the town knocking back a few snakebites? AB Oh no, that wouldn't got down too well at our daily 0700 swim swim session! AE You seem to be having a lot of fun in your new found career, but what would you say is your best moment in triathlon so far? AB Finishing second at Ironman UK with all my family there to watch. AE Have you made any plans for the rest of the season? AB Well as you know I'm currently on Jeju Island in South Korea training with the rest of the Team TBB squad who've also qualified for Hawaii. So in October I'm off to the World Ironman Championships then after that I've got the World Long Distance Championships in Perth, and then all being well, Ironman Western Australia in December. AE And your dreams and aspirations for beyond 2009? AB To keep on improving and see Team TBB and The Bike Boutique grow and thrive. AE If you could have one dream what would it be and why? AB To fulfil my potential and help other people fulfil theirs. As part of Team TBB I would like to help influence the sport in a positive direction. AE And finally, do you have any more thoughts of becoming a hairdresser (check out Abi's attempt at hairdressing on her blog) when you finish racing?